Earth is hiding some of its most impressive mountain ranges deep within its mantle. But in between these distinct layers, there’s even more-detailed anatomy. Dividing the mantle into upper and lower layers is the transition zone, with its deepest part being the so-called 660-kilometer (410 miles) boundary. And now, geologists have found that this boundary hides many mountains, researchers reported in a new study published Feb. 14 in the journal Science. These mountains are more rugged, with large differences in elevation, than the ranges we’re familiar with on the surface, such as the Rockies and Appalachians, according to a Princeton University statement. In order for the scientists to discover these mountains, buried some 410 miles below the surface, our planet needed to shake — a lot. The mantle is divided by a layer called the transition zone. The deepest part of this zone dubbed the “660-km boundary” houses impressive mountains. In an international collaboration between Princeton University and the Institute of Geodesy and Geophysics in China, scientists analyzed data from a magnitude-8.2 earthquake that shook Bolivia in 1994. Seismic waves change depending on what they hit; while they travel straight through smooth rocks, the waves scatter when they hit boundaries or any kind of roughness. Seismologists on the surface can detect how much the waves scatter and use that data to figure out what’s below the surface. 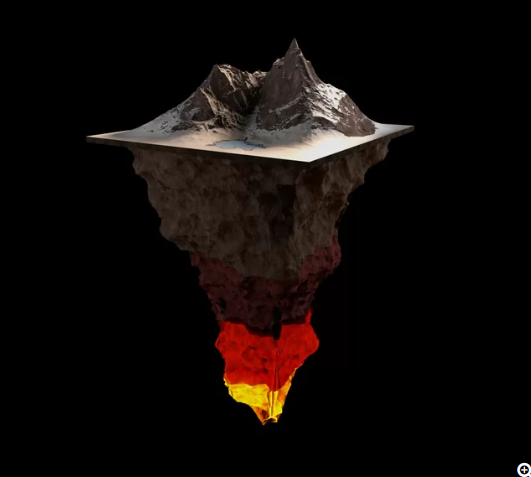 Doing just that in the new study, the researchers created a simulation of what the top of the transition zone and the bottom (the 660-km boundary) in the mantle looked like. While they found that the boundary contained roughness, it’s unclear whether the mountains are taller than those we’re familiar with on the surface of the planet. Similar to what’s found on Earth’s surface, the topography at that boundary varied quite a bit, the researchers found. Furthermore, at the very top of this zone, at around 410 kilometers down (255 miles) they found very little roughness. Discovering why this boundary layer looks the way it does could help scientists understand how the planet formed and how it now functions, the statement said. It’s unclear whether the upper and lower mantle are mixed or remain independent of each other, each with its own chemical makeup. For years, geologists have debated whether this transition zone keeps the upper and lower mantles from mixing. But the newly found topography itself could yield insight into whether the two intermingle. The smoother areas of the boundary could have resulted from mixing of the two layers, while the rougher areas could have arisen because they couldn’t mix very well in those spots, creating deposits, the researchers said. The deposits themselves could be from rocks that migrated long ago from the crust into the mantle, now resting near the 660-km boundary, possibly right below or right above it, the statement said.